Promises, promises. They are easy to make, especially around the New Year, but much harder to keep. Maybe you have pledged to get a better attitude, lose some weight, or work on your relationship with a significant other. A couple of weeks into 2016, however, things might not be looking so good. Now you could beat yourself up about not meeting your goal, but maybe it is time to take a step back and look at things from a different perspective. Here’s a radical idea: maybe failure isn’t such a bad thing. In fact, failure might be the best way to succeed, the kick-start you need to find true love, the cornerstone of scientific progress and the best thing about competitive sports. Don’t take my word for it though, check out these books from your local library and see for yourself. Alright, let’s face it, you have failed at something. As the experts say, admitting the problem is half the solution. Also, take a look at these three books to gain some perspective and move forward. Failure is not a term you would normally associate with the creator of Harry Potter, but it has been a key component of Rowling’s life and success. Learn all about it in this commencement speech she gave at Harvard University. Another commencement speech, this time given at Naropa University, that stresses the importance of failure as the way to becoming a complete and fulfilled human being. In addition to being a prolific author, Chödrön is also a Buddhist nun and resident teacher at Gampo Abbey Monastery in Nova Scotia. For Syed, failure is inevitable for everyone at some point. The problem comes when mistakes aren’t acknowledged and people refuse to examine their failure and learn from it. Much like the black box of a commercial aircraft, the data needs to be analyzed to find out what went wrong when a failure occurs. Things don’t always work out. Happily ever after can be a long time coming. 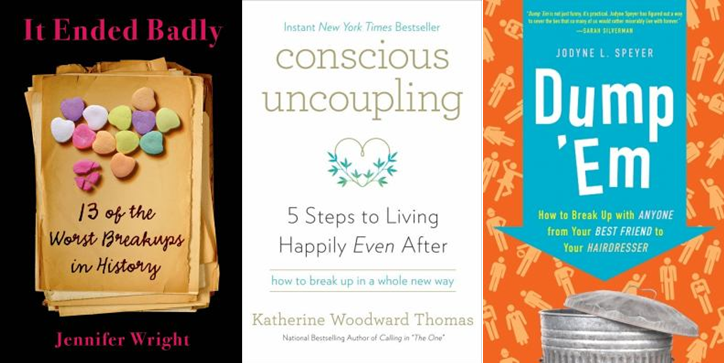 While you wait, take a look at these books to help you cope with a failed relationship. It Ended Badly: Thirteen of the Worst Breakups in History by Jennifer Wright. If you want to take the high road when it comes to a breakup, this is the book for you. Promising to show you how to ‘break up in a whole new way’, Thomas advises both parties to avoid bitterness and anger and focus on what was positive in the former relationship. Sometimes you have to be the one to end things. Not an easy task, but this book has got you covered. Chock full of personal stories, useful scripts and interviews with experts, Speyer’s book will show you how to break up with almost anyone. The discipline that brought you successes such as medicine, technology and a way of building knowledge about the universe is fueled by a surprising concept: failure. Take a look at these books to find out why. The image of an infallible truth-dispensing scientist in a white lab coat is an illusion, argues Firestein. Instead science is a process of trial and error that produces many failures. These failures are crucial in producing an ultimate success. It is not only the humble that make mistakes, many of the scientific greats did as well. 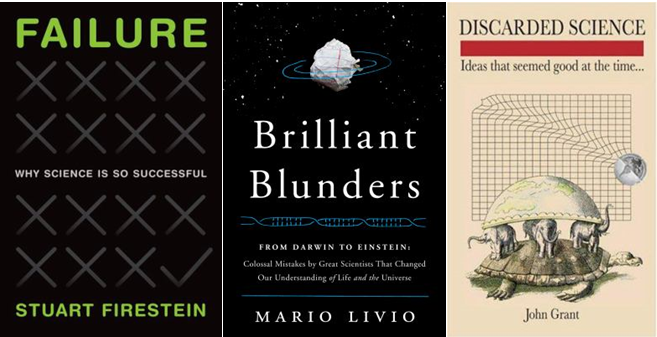 Charles Darwin, Lord Kelvin, Linus Pauling, and Albert Einstein all made significant blunders on their way to genius status. Clearly there is hope for all of us. This book is a true rogue’s gallery of failed ideas and bogus theories that were once deemed plausible. From the flat earth theory to phrenology, every dubious theory that was once thought of as ‘scientific’ is examined and explored. I’ve never been much of a sports fan, but I have always had a soft spot for teams, and the fans who support them, that almost never seem to win. Call it the nobility of continual failure. Here are three examples. Since the team rarely finishes a season above .500, Mariners fans are a long-suffering, but in my view, admirable bunch. Learn all about their trials and travails in this colorful history of the team. The author has been covering the Mariners for over 15 years and has his own theories of why the team can never seem to win. The Chicago Cubs are arguably the original sports team that never seems to catch a break. This DVD, narrated by Gary Sinise no less, documents the few ups and many downs of the team and its fans. You know there will be a clip of Harry Caray, preferably after having a few beers after the seventh inning stretch, singing ‘take me out to the ball game’. Green Bay Packers: Trials, Triumphs, and Tradition by William Povletich. I know the Packers currently are far from being failures, but when I lived in Title Town (the late 70s and 80s) they, quite frankly, sucked most of the time. It was hard not to have a grudging admiration for the fans who stuck with them through all those fallow years. Interestingly, the team starting doing really well once I left. Coincidence? I think not. So clearly, as all of these materials demonstrate, you have no reason to feel bad about any recent failures that might have come your way. As always, the EPL has got your back. Of the many things you can say about the great State of Washington, one of the best is the fact that it is downright weird. While some may think being called weird is a put down, something to be avoided or hidden away, it is really a great compliment. The opposite of weird, boring old normal, is the last thing a state wants to be. The normal states are the ones you drive through on your way to something interesting. So what is weird about Washington? After reading either Weird Washington by Jeff Davis or Weird & Wacky Washington Places by Bree Coven Brown you will be asking yourself, “What isn’t?”. Both books try to categorize the unknown and give plenty of detail on such local oddities as the Fremont Troll, the mysterious disappearance of D.B. Cooper, and of course Sasquatch. If you have trouble suspending your disbelief and want to treat your inner skeptic, check out Annals of Gullibility. Stephen Greenspan provides a rational and scientific explanation of why we are drawn to the unexplained. You could even find out who wore the ape-like costume in the infamous film, made in Washington of course, that made the legend of Bigfoot so popular by reading The Making of Bigfoot by Greg Long.